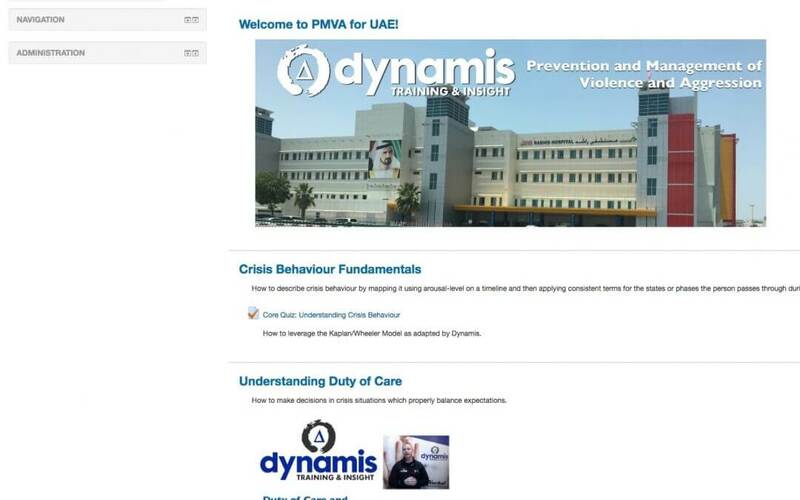 At Dynamis we have been promoting the use of online learning now for a number of years, in an effort to “Flip the Classroom” and now our clients in GCC and MENA are benefitting from this endeavour! From Wikipedia: Flipped classroom is an instructional strategy and a type of blended learning that reverses the traditional learning environment by delivering instructional content, often online, outside of the classroom. It moves activities, including those that may have traditionally been considered homework, into the classroom. In a flipped classroom, students watch online lectures, collaborate in online discussions, or carry out research at home and engage in concepts in the classroom with the guidance of a mentor. Using our richly-featured online training system in this way, we maximise the in-person time in the classroom and bring maximum benefit to our clients for Conflict Management, Personal Safety and Physical Intervention training courses. We currently have specific online learning in place for a number of our UK clients, predominantly our schools who use the online learning to help them to proportionately and efficiently apply resources to Positive Handling training. This month we are rolling out specific online learning for clients in Doha (in the Education sector) and in Dubai (in the Healthcare secotr) both of whom are using the online training which has been tailored for their specific environments and needs. We have further projects planned for the GCC and MENA areas.